The Greylag Goose is doing well in western Europe. After years of decline the numbers are growing. Now the Greylag Goose breeds in large numbers in the Netherlands and that affects both agriculture and nature. Agriculture because pastures are stripped bare, nature because the geese defecate in nature areas, which leads to eutrophication. There is much debate on the desirability of killing a percentage of the population every year. Difficult problem, what to do? 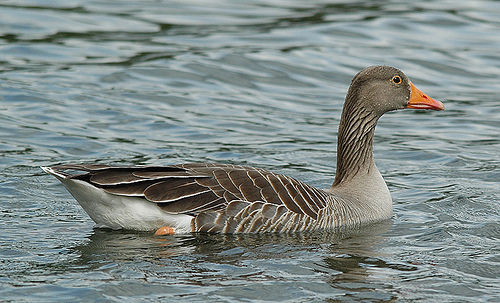 The Greylag Goose has a plain brown belly, the White-fronted Goose often has black spots on it. Also, the wings of the Greylag Goose are grey, instead of the brown wings of the White-fronted Goose. The Greylag Goose has no white forehead. 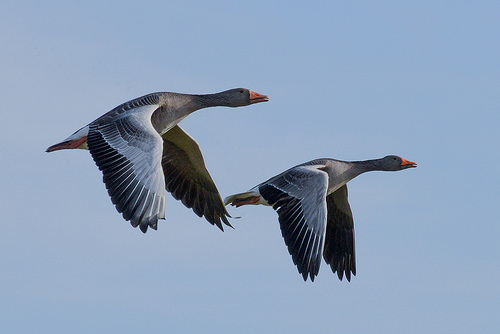 The Greylag Goose is larger and has a thicker neck than the Pink-footed Goose. Its head is light brown, the Pink-footed Goose has a dark brown head. The beak of the Greylag Goose is orange. 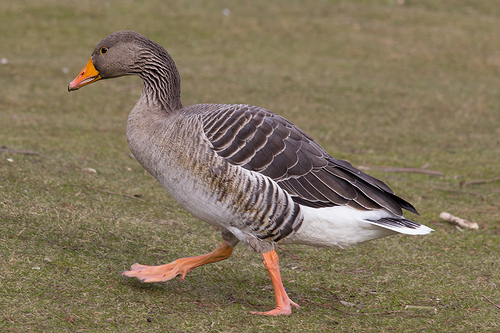 The Greylag Goose has pink legs and a lighter grey appearance. The neck and the head are light brown.